On this page you will find answers to the questions we are most frequently asked. If you have any other questions or comments then feel free to get in touch by phone or through our contact form. We are always happy to help. Yes. We provide a range of finance options through our finance partner, Close Brothers. This enables you to spread the payments for your Brazilian campervan, normally over three, four or five years. Are Brazilian campers still being made? Brazil ceased the manufacture of VW camper vans due to the imposition of new government vehicle regulations in 2012-2013. This means that these vans are quickly becoming rarer and therefore are likely to increase in value as years go by. Can you renovate my campervan? Yes. We offer a wide range of services, including a full major service, re-upholstering, re-sprays, roof conversions, adding power steering and much more. If you have a project that you need to complete then get in touch by phone today and we will give you an idea of how much it will cost to complete. These campervans are also known as Danburys and Model T2s. Can you contact me when new stock comes in? Yes. We have a stock alert page where you can fill out a form and we will let you know when campervans come into stock. You can steal a march on others looking for model T2s, and get the best opportunity of grabbing yourself your dream van. Do your Brazilian Campers come with an MOT? Yes. Most of our VW T2s campervans are sold with a 12 month MOT. Do your vans come with a warranty? Yes. Most vans are sold with a three month parts and labour warranty. Yes. We are premium vendors of quality Danbury campervans, and our vans normally have a full service before they are sold. Do you have low mileage camper vans in stock? Yes. Some of our vans have less than 10,000 miles on the clock. As newer models, they tend to be much more reliable than the 1970s VW camper vans you may have bought in the past. What kind of MPG can I get out of a Brazilian campervan? Obviously, different vehicles will do different mpg, but it is possible to get over 35 mpg with the campervans that we sell. I want to sell my campervan can you help? Yes. We have two main options available to you. You can either sell your campervan through us for a small commission of 10% plus VAT, or we can buy it from you outright and take ownership. We have been one of the south coast’s leading retailers of VW T2s for over five years now. We have built a tremendous reputation for selling quality vehicles at very reasonable price points, and doing top quality campervan refurbishment work. Can I come and see your stock? Of course. If you’re interested in a specific vehicle then please phone ahead to make sure that we haven’t sold it today. 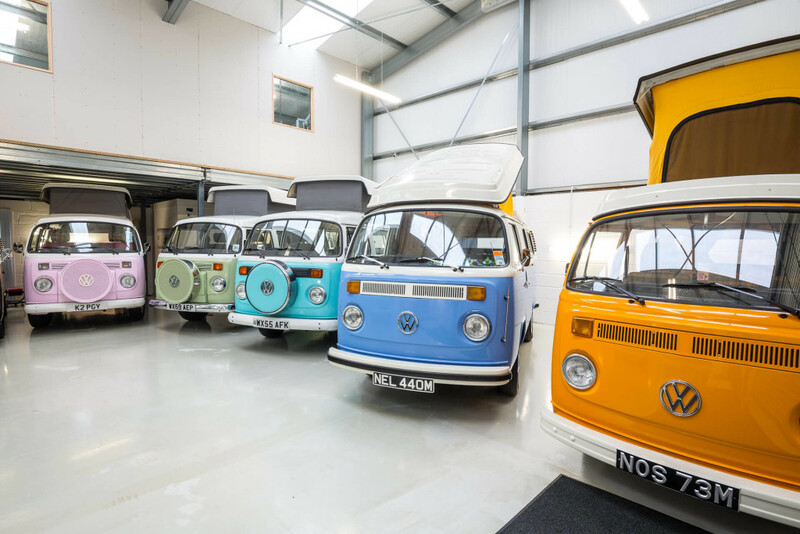 We will be more than happy to show you around our top quality VW campervan stock.